First Line: From his idling van atop the Golder Ranch Road bridge, Gerald Peasil examined his next girlfriend. Brigid Quinn used to hunt sexual predators for the FBI, but she was pushed into early retirement. She tells herself she's settling into the next phase of her life nicely with her new husband and their dogs down in Tucson, Arizona-- and she would have been if Floyd Lynch hadn't confessed to the worst unsolved case of Brigid's career. Lynch knows things about the disappearance and presumed murder of Brigid's young protégée that were never made public, but the new FBI agent on the case thinks the confession is fake. It doesn't matter that Brigid is retired; she's just realized that she cannot walk away. Not from this one. It's too personal. 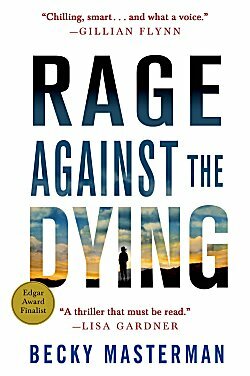 Our introduction to Brigid Quinn in the prologue of Rage Against the Dying is a memorable one. When prologue flows into first chapter, we know we are embarking on a journey with an unforgettable character. Brigid Quinn is fierce, uncompromising, and unflinchingly original. She is as far from being a normal "woman of a certain age" as the Earth is from Saturn. She's seen too much, and she's done too much; but what put me firmly in her camp come what may is the fact that this intelligent, strong woman looking sixty straight in the eye is an almost complete novice at relationships with other people. Every hero should have a flaw, and Brigid's carries the potential for a lot of damage. The man she's fallen in love with is a wonderful character, and although we see him through Brigid's eyes, we're given hints that he isn't quite the man she believes him to be. This fledgling relationship adds so much to the story! Speaking of the story-- it's completely engrossing. Once I started reading, I didn't come up for air until I'd turned the last page. The hunt for the killer and the killer's final reveal? Fabulous. When I was finished reading, I sat for a few minutes with my eyes closed, simply holding the book and savoring what I'd just experienced. What fuels me as a reader are characters and stories. Becky Masterman has delivered both in superb style. Now I'm an addict and getting my hands on the next Brigid Quinn book has become a necessity! Oh, it's so nice to have a strong, appealing protagonist who isn't twenty...or thirty! I love it! And the story sounds intriguing too, Cathy. Glad you enjoyed this. Powerful writing is a joy when you find it. Sounds like a good one. Oh, gosh, here goes the TBR list tipping over again. If you gave it an Aplus and loved it, I'll look for it at the library. Need a book like this for the summer, begin it and not look up until it's finished. Hopefully your mileage won't vary, Kathy!